Go Abbe: Good morning, Queen Silvia. 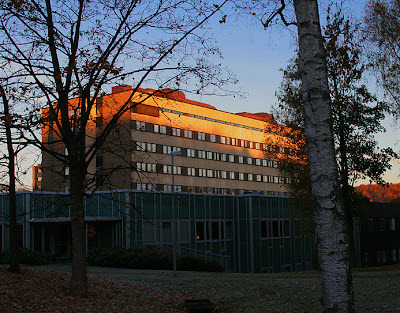 The Children’s hospital, in the morning sunshine. Inside the window furthest to the left in the upper (but one) row, Abbe is asleep. The sunbeams have not quite yet reached his bed. But they will. Soon. Ice cream - excellent medicine. How do you treat fear of hospitals? Nurses – a little genus check 2. A little film from the Intensive Care Unit. At 09.38 – the removal of more tubes. ICU – an intensive care unit. At 13.20 – respirator taken off! Nurses – a little genus check. At 11.30 – A drain removed. Drugs are crap. Dormicum is gold. At 09.00 – PA-catheter taken off. On our way to the operation. Test driven this time: Toyota Prius. You never get used to it. Short recap of the day. Willpower enough to move mountains. New morning routine this week. Information meeting at the kindergarten.